As promised here is my post on traditional gliders. Beware it is a long one. I'm just going to start with my favorite glider company, The Taylor Scott Collection (pictured above and in the two photos below). All of their furniture is bench made in Los Angeles the "old fashioned way" (the springs are eight way hand tied and the frames are made with kiln dried hard wood). 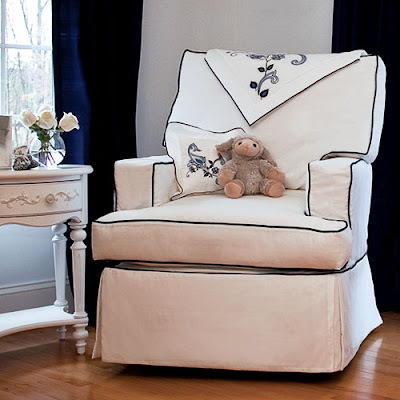 All slipcover fabrics are hot washed before being cut and sewn to eliminate shrinkage. They have an array of high quality fabrics to choose from (solids, patterns, linens, chenilles...you name it). 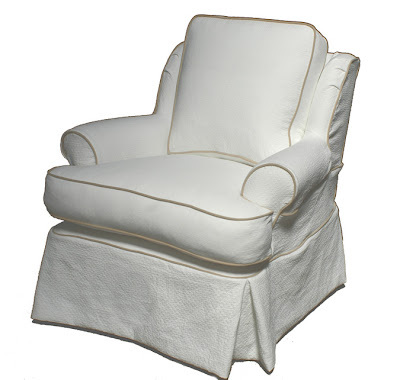 The chairs can be upholstered or slipcovered plus the seats and backs are goose/down wrapped. 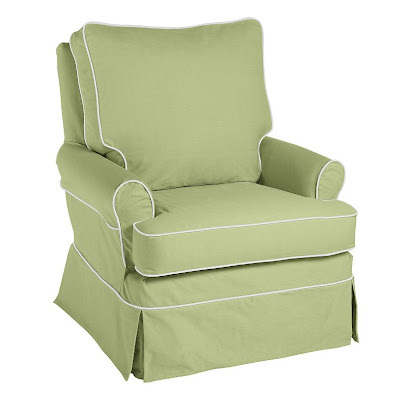 I could have chosen any of the chairs in this post as my glider (since we carried most of the lines at Sprout) but I chose this one. Granted I was able to purchase it at a discount therefore price was not as much of an issue, but regardless I still love my choice. Taylor Scott Collection is available for purchase at Layla Grace on-line and available throughout the US. Their chairs are expensive for a glider in a nursery but remember that this is bench made furniture and the quality is impeccable. With a new slipcover it can be used for years. My chair still looks the same as it did over a year ago. Perfect glider dimensions for nursing and the firm back offers wonderful support and structure. 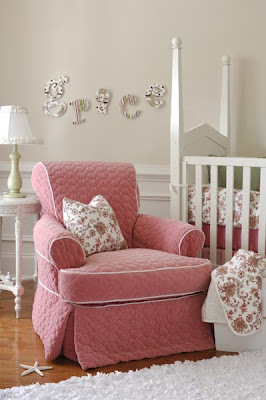 Little Castle was our most popular and top selling glider vendor at Sprout. They definitely give you the bang for your buck and have a very large selection of styles and sizes. If you don't have to have down filled pillows and want a glider for $500-$1000, Little Castle is a wonderful choice. They have a very large swatch book (try to stay away from the Fuzzy Wuzzy Dots fabrics as they tend to wear badly) so you can customize with chenilles, linens, prints, and micro suedes. They also accept COM fabrics for an additional charge of $150 per chair. 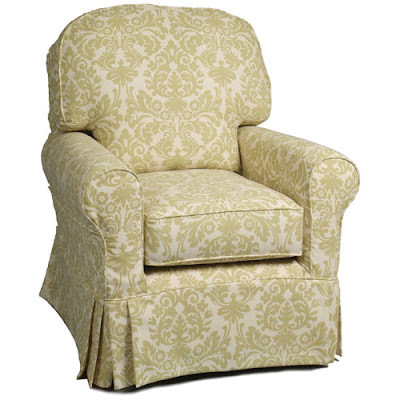 The Buckingham is a large loose cushion glider and is available slip-covered, upholstered or as a recliner. 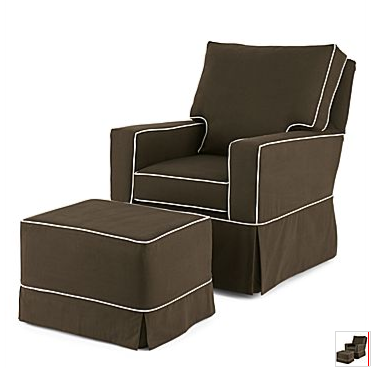 It is extremely comfortable and my favorite Little Castle Glider for tall moms and dads. See how the depth is 38"? That is why you have to be tall otherwise you have to exert some energy to get out of it. You literally sink into it. If you like the feel of the Buckingham Glider but need a smaller glider because of your height or because of space. I'd choose the Cottage Glider (shown above), but make sure you get the Cottage SS (Super Size) the standard cottage is a little too small. 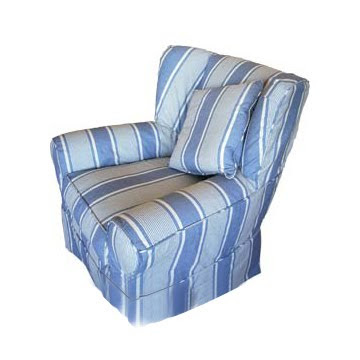 If you are really strapped for space and can't have an ottoman, get the Cottage Recliner (shown below). Not your typical Lazy Boy recliner. 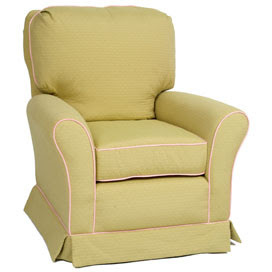 This style looks a lot like the Serena & Lily Ashbury glider (mentioned below) but has a much higher back. Now Little Castle does make two styles of gliders especially for JC Penny at a very low price. The quality is the same, sizing is a little different, price is lower, and you have a limited selection of fabrics, but the price is very inexpensive. 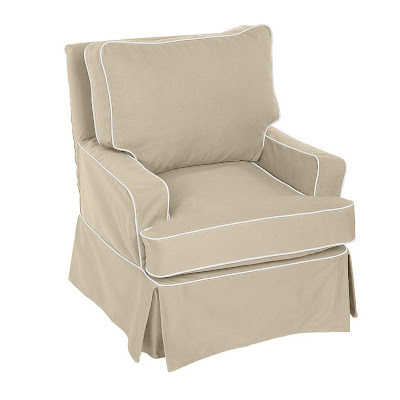 Clean lines, good construction, great price, limited fabric choices, but if the fabrics work for your nursery this is a great choice. JC Penny's version of the Cottage (not the Cottage SS) glider in limited fabric choices. Same construction, similar fit. Little Castle is available at most children's decor stores. If you live in Manhattan Beach visitBella Beach Kids to sit in and purchase one or if you are in Los Angeles, visit the Juvenile Shopin Sherman Oaks. As an added bonus for those of you outside of the LA area, Posh Tots is having a sale on their Little Castle Gliders, 20% off for a limited time. Serena & Lily has three gliders available in wonderful custom color combinations with alternating pipe. They make the ordering process so easy with their website and the colors coordinate wonderfully with all of their collections, why would you not order one? Although I love the designs and fabrics of their traditional gliders, the comfort is a little off for me. 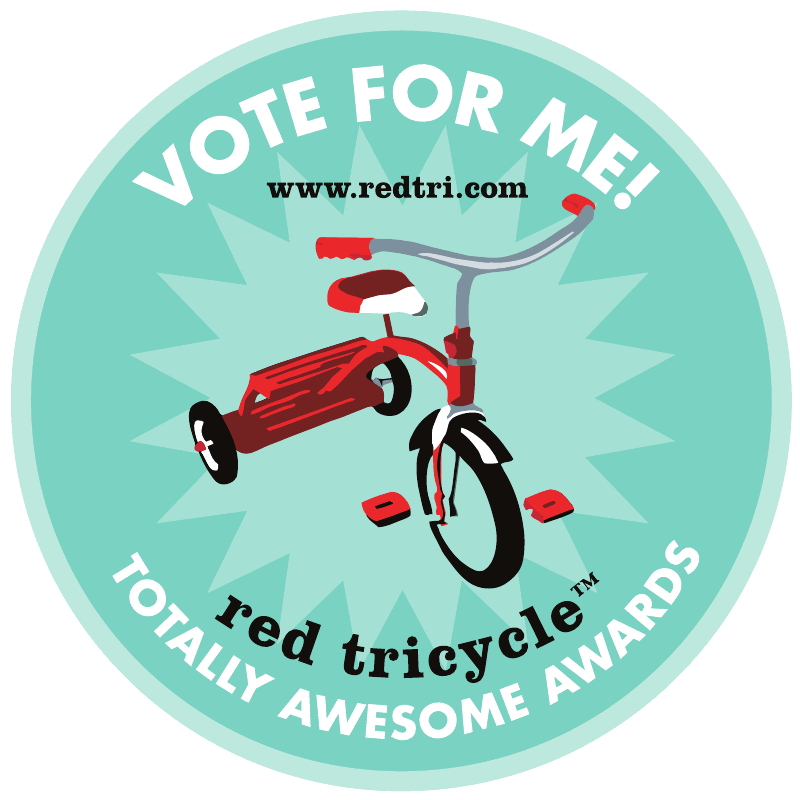 (I already reviewed the more non-traditional Presidio Glider here in a previous post.) Their gliders are manufactured by the same company who makes the furniture for Pottery Barn, Hiatt Furniture. This is a reputable furniture company and the quality is very good, but if you notice the height on these gliders is the lowest of all the styles mentioned previously. This just means that your head will lay on the top of the chair instead of resting against it when leaning back. This might not be an issue for some of you but for me it is not optimal. 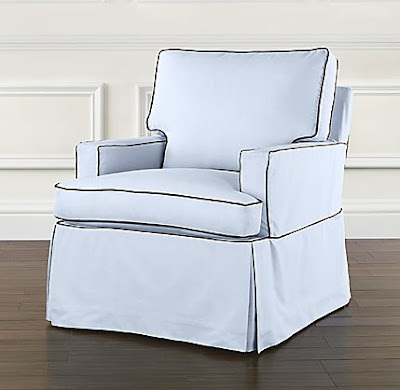 I like the compact shape and the look of the square arms on the Ashbury Glider, but this glider is too compact for my tastes and I'm only 5'5". 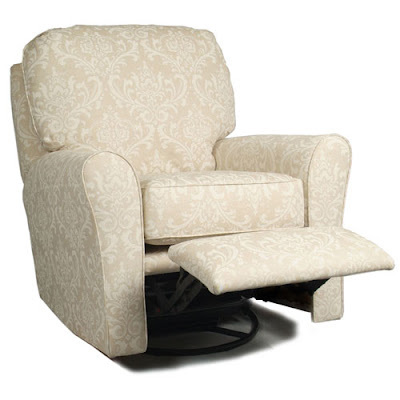 The Hayes Glider is much more comfortable and has a higher back and round armrests. But I will warn you that unless you are over 5' 7" the seat on the glider is going to be a little short for you. It is better suited for dads and taller moms with long legs. We all love Restoration Hardware, it is a no-brainer clean and classic look. I like the style of their gliders, they actually look almost the exact same as the Serena & Lily styles. The price is around the same and you have a down filled option, but you don't have as many unique color combination options. The downside is that unless you have a friend who has one, you will not have the opportunity to sit in one as they are catalog and web only items. A friend of mine has this glider and I have sat in it. She did pick the down blend and linen option so it was comfortable but the height was still very low. For the same look and the same or lower price I would choose the Serena & Lily instead. Honestly I have not sat in this style but it looks too short in the height for my taste in gliders. This might be a good sitting or reading chair but not the best suited for nursing. The last glider that I'm going to review is Jenny Bec's famous glider. The picture above does not do this piece of furniture justice because it is very good-looking and extremely comfortable. The height and depth of the chair is perfect plus the wings on the side give you a place to rest your head. 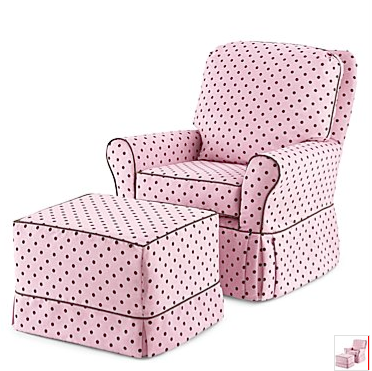 I don't have the exact dimensions but it is around the same size as the Taylor Scott Emma chair listed first on this post but looks like their South Hampton Chair except the slipcover is not as tight. Now here is the kicker, the glider & ottoman costs $1200 (which is a good price for both custom pieces) but you then have to pay for the 10 yards of fabric to upholster the chair. Either choose fabric from their store or you can bring in your own COM. This will run you around another $500. 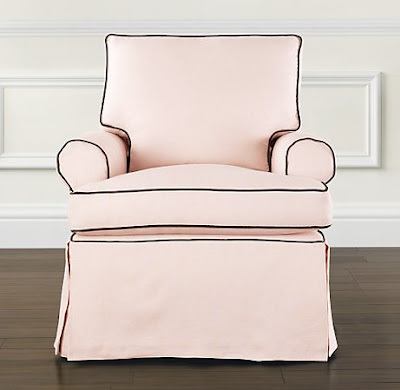 Even though I do really like this chair, my first choice would still be a Taylor Scott Collection glider or the Little Castle Cottage SS, Recliner or Buckingham. As a little disclaimer, I am only reviewing traditional gliders that I have actually sat in and tested out. I know that there are a few others available from JC Penny, Pottery Barn, and Ikea but since I have not sat in them, I did not feel it was fair for me to review them critically. If you have any feedback please comment, I would love to hear your thoughts on these and other lines. Thank you so much for such an informative and comprehensive review on traditional gliders! Your posting helped me so much and now I can decide which one to choose for my babygirl's nursery room! Thank you so much again & your blog is so beautiful! I know I am a little late to this post, but have you had any feedback regarding this glider http://www.jenniferdelonge.com/prod/165 ? This post is so helpful. I am trying to find where Taylor Scott is sold in the Dallas/Fort Worth area and am not having any luck. Any suggestions on where I could go to see the fabric swatches in person? Hi I agree with you that's really helpful I like that.I am also trying to find where Taylor Scott is sold in the Dallas/Fort Worth area. Great post. I'm wondering if you any feedback on the land of nod gliders. Greeting from BabyBox.com. We have been online for over 18 years and are one of the preferred online stores that work with Taylor Scott, Little Castle, Angel Song and Art for Kids. We would be happy to work with any of you that need to have swatches of fabrics sent to you in advance of ordering. Many new swatches come out every day so let us help you find just the perfect look. Buying a recliner isn't a difficult task, but it is something that requires a certain amount of effort. And I don't have to tell you that in this case, the ends justify the means. There is something special about leather rocker recliners. So you can collect them. Some like their kitchen design open and public, some like it walled-off and private. We examine the pros and cons, and come up with the perfect solution. The idea of the open kitchen has been around since the 1990s and continues to be popular.